Nowhere is it more gratifying seeing your name printed-out on a piece of paper than stepping off the bus from Hoi An to rain-soaked chilly morning at Hue. I had not expected that my hotel, the Original Bihn Duong, located a little away from the traveller ghetto would send a free car to pick me up. But there it was! As everyone was trying to get their bearings in the cramped lobby of the hotel where the bus dumped us all, I looked up to see a man standing outside with a piece of paper. Thank god for hotel pick-ups. I had a really nice room at the hotel and the staff was ultra friendly and accommodating, pouring everyone a cup of hot green tea every time they sat down at the lobby. Since my room was still occupied, they gave me a temporary room on the third floor which I could use. It was a really big one with three beds. 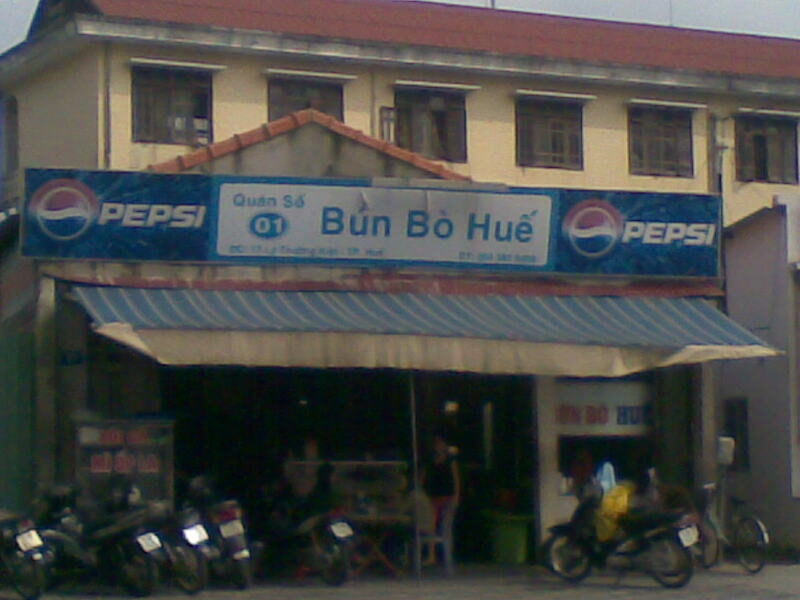 Looking out the window, I saw a sign on top of a local eatery— “bun bo hue” it read. It was listed at Wikipedia as the place for this specialty. And it was just what the weather ordered. I took one of the few empty spots and sat down. There was no need for any words in this local eatery. You merely sit and wait. A server soon set down large steaming bowl of noodles in a hot herbal broth with chunks of pork. The flavorsome broth slowly melted the cold away. The soup was so good I was halfway through before I took a break from slurping. Thumbing through my Lonely Planet Vietnam, the bespectacled guy beside me who came in just about the same time as me, asked me where I am. He looked like he was in his early twenties and Vietnamese. “Philippines.” “I’m from New Jersey.” That explains his English. He’s from the US and is currently on vacation with his family. He reminded me of Israel, a college classmate. He was always hungry he said and can finish two bowls of soup. After this, he was going to buy some bahn beo at a stall down the street. I walked several paces behind me to see where the stall was. With my broken umbrella, I could say that I was looking to buy a new umbrella at one of the general merchandise stores lining the street should he spot me. I did discard my umbrella for a new one which cost a whopping $ 4! I never made it to the Citadel though I reached the foot of the bridge that spanned across the river. With the driving rain, I had to turn back. Kinda hard to be holding an umbrella while you’re looking at a map with the other hand. What to do next? Get some bahn beo to soothe the frustrated soul. I got one plus the some smaller fried ones. I ate them back at the hotel and they were good. Seems like the rain won’t let up the rest of the day.